A PRIZE-winning work in Victoria’s Indigenous Art Awards was literally a dream come true for its creator Glenda Nicholls. 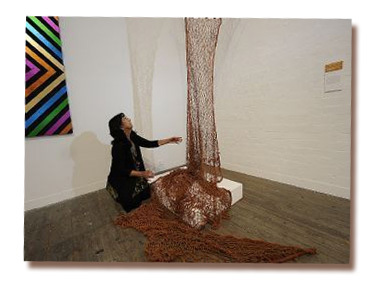 Two weeks ago, Nicholls, a Northcote resident, won the $5000 Koorie Heritage Trust Acquisition Award and the $5000 Victorian Indigenous Art Award for her carefully crafted Ochre Net. “I dreamt I wove these two nets and so I decided to do just that,” Nicholls said. An educator, author and public servant, Nicholls is a modern woman of the world. But the spirit and culture of her ancestors runs through her veins as surely as the mighty Milloo (Murray River) runs through her home town. “While I was making the net, I started thinking about how important it was for river people to own a net and catch fish and birds to feed their families,” she said. Nicholls made her net from jute twine she bought from a hardware store, which she said was the closest she could find to the bush twine crafted from the river reeds her ancestors used. Nicholls, the granddaughter of Aboriginal rights and reconciliation pioneers pastor Sir Douglas and Gladys Nicholls, said it was important to bring traditional culture to modern day life. “You might only learn one thing but this becomes part of you,” she said. An exhibition of winners and finalists is on at fortyfivedownstairs, 45 Flinders Lane, Melbourne, until March 31.